Until I moved North I lost out on the pleasures of seeing the first seedlings of the season pop out of the ground and the joy of picking tender pea shoots and early radishes. Growing up in Southern California where it’s 75 degrees 350 days a year you lose touch with the cycle of nature. I have come to appreciate the seasonal swing of life especially when it comes to food. I love to see what the first market of the season has to offer. 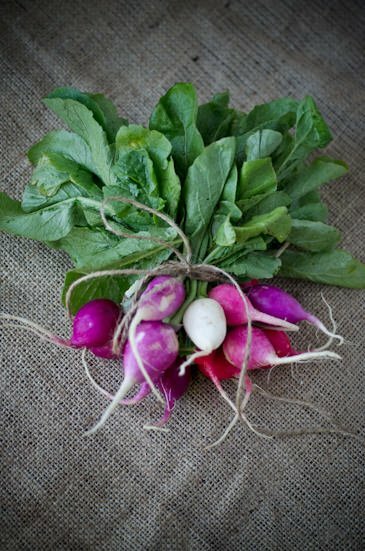 Radishes, fava beans and snap peas are at their finest during the chilly wet start of spring here in Portland and when I see them appear I know that warmer weather and long days in the garden aren’t far behind. I know that radishes aren’t the sexiest of vegetables but I have a particular fondness for their sharp pungent bite. 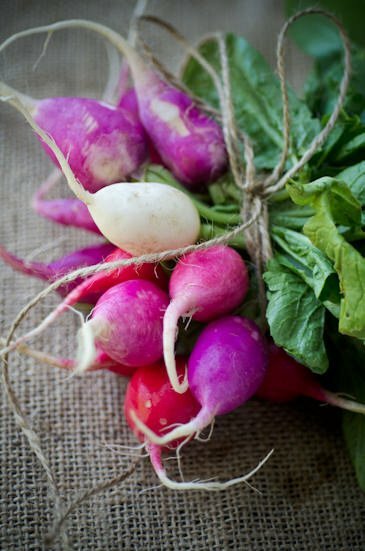 Growing radishes is one of the simplest things you can do in a garden and they go from seed to table in a matter of weeks. 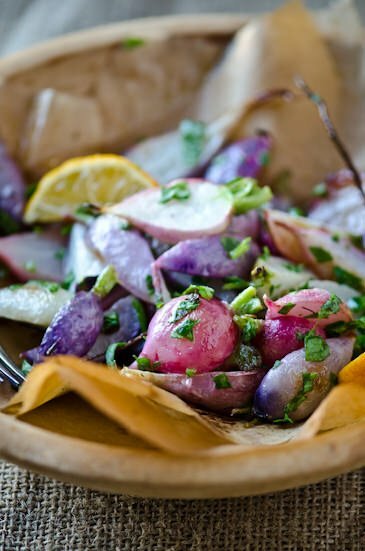 Roasting radishes over high heat mellows their sharp bite and renders them sweet, succulent and mellow. Reserve the tops to garnish the finished dish, they add a nice brightness and bite. Pre-heat the oven to 450 degrees. Cut off all but the top 1/2 inch of the radish tops and slice the radishes in half. 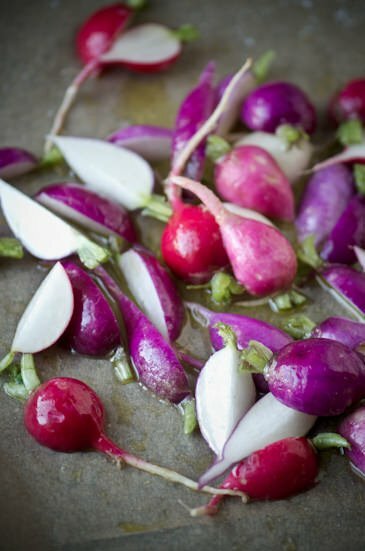 Toss the radishes with the olive oil and season with salt and pepper. 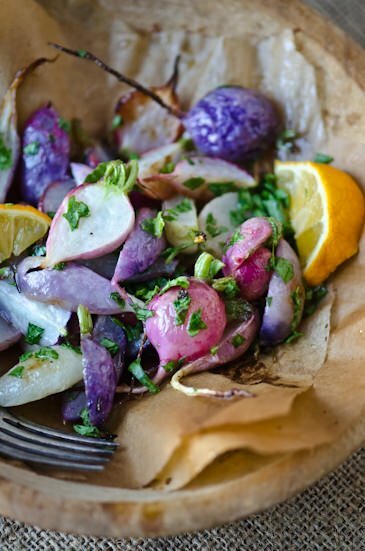 Roast the radishes until they are tender about 15 to 18 minutes. Stir in the fresh lemon juice and sprinkle the radish tops over the top. Simple, beautiful, delicious. I’m in Montreal and sowed my first radishes last Sunday. Can’t wait to give your recipe a try! I was a little late getting my radishes in the ground this year. I hope I still have time to get a few batches in before the weather gets too hot! Yum, I never knew you could roast raddishes. Or eat their tops. Can’t wait to try this, thanks! It’s a nice change from the usual roasted vegetables. The lemon really makes the flavors pop. Hope you enjoy them! ooo intriguing.. 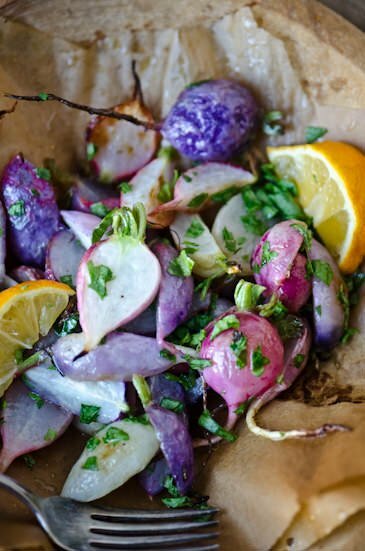 I never thought you could roast radishes either! I’ve been working on a farm and brought home too many radishes to know what to do with, so this is perfect. Thanks!